Last updated 31 August 2017 . By Tom Capon. There’s a real diamond of a restaurant open in The Lanes as jewellery shop Pressley’s welcomes 1909 onto its first floor. Named after the year the business was founded, the venue hopes to deliver top quality, organic small plates while still being affordable. The interiors are made of floor-to-ceiling walls, a marble bar, and splashes of gold, illuminated by dozens of spotlights on the ceiling, which they hope will keep the shop’s upscale aesthetic. 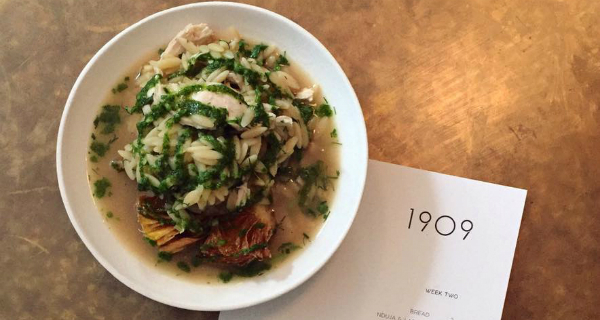 Despite appearances, the food at 1909 is surprisingly affordable, ranging from £5 to £7 a pop. The modern British small plates are ingredient-led, and have influence from Japan and Italy, featuring dishes like pork cheek and parsley cencioni, and grouse potsticker with shiitake dashi and greens. Meanwhile, the drinks menu is focused on natural wines, offering up by-the-glass varieties alongside an ever-changing bottle selection that they want to use to showcase four different producers at a time.